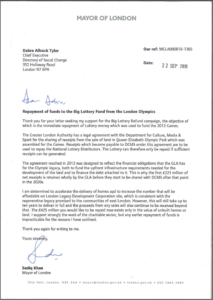 The Mayor of London has replied to our letter asking him to support the campaign to have Government repay the money it raided from the Big Lottery Fund in 2007 to pay for the London Olympics, denying communities £425m worth of vital grant funding. 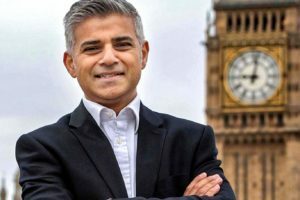 The Mayor of London, Sadiq Khan, has responded to a letter sent to him by the Big Lottery Refund campaign in which we urged him to support our calls for government to repay £425m it owes to the Big Lottery Fund. In his letter, he expressed support for the work of the voluntary sector, but explained that an early repayment is ‘impracticable’. He points to two reasons for this view and suggested that the repayment to the Big Lottery Fund would be unlikely to be completed before the 2030s. Firstly, the fact that the agreement between the Greater London Authority (GLA) and the Department of Culture Media and Sport (DCMS), which is responsible for the Big Lottery Fund, will see the former receive the first £223m of any receipts from the sale of assets. In other words, when Olympic assets are sold the GLA will be entitled to the first £223m of the receipts, with income after that being split with DCMS. The second reason is that the priority for the use of the Olympic site is to build affordable homes and that the revenue from these will finance the debt to the Big Lottery Fund. a process with would understandably take a long time. Mayor of London estimates that charities won’t start to receive the money until after 2027. Although he does say ‘if’ the houses are sold, which sort of casts doubt on it. 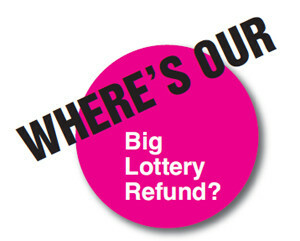 However the Big Lottery Refund campaign is of the view that the government can settle its debt to the Big Lottery Fund immediately, without altering the agreement between the GLA and DCMS, and without denying finding for vital housing projects in East London. The way forward is for the government to immediately make a repayment and take on the role of debtor, to itself receive money from the proceeds of the sale of assets on the Olympic site. Here’s some of the things communities could have now if the government honours its commitment.